This summer make the most of your holidays and head to Sydney to be a part of the biggest celebration of lights, music and ideas at Vivid Sydney. The 23 day long multi-award-winning winter festival will see Sydney illuminate with creativity and innovation with works by some of the world’s most famous artists. This edition of Vivid Sydney has an interesting line-up of iconic performances by Australian and international superstars like Solange, Iron & Wine, Ice Cube and many more. The 10th edition of the festival promises to get bigger and better. For the first time, Vivid's stunning Light Walk will extend to Luna Park, where the iconic Ferris wheel will be lit up. 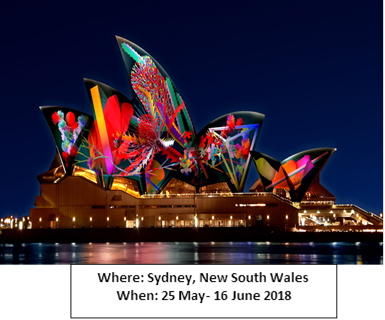 The Sydney Opera House will be embellished with so many colours and patterns that it will take your breath away while the iconic Sydney Harbour Bridge will be adorned with a synchronized lighting display, as vessels adorned with brilliant LED lighting pass through parts of the grid, colours on the Bridge will change simultaneously. Tap your feet and groove to a set of varied tunes ranging from jazz, rock, indie to music by contemporary artists. The one-of-its kind cultural festivals will witness some of the biggest game changers and creative thinkers including Oscar winning director, James Cameron, world famous skater and environment activist Peggy Oki explore and discuss various future shaping scenarios in the most creative manner. So come and partake in the celebration of lights, music, art, ideas and of course life!